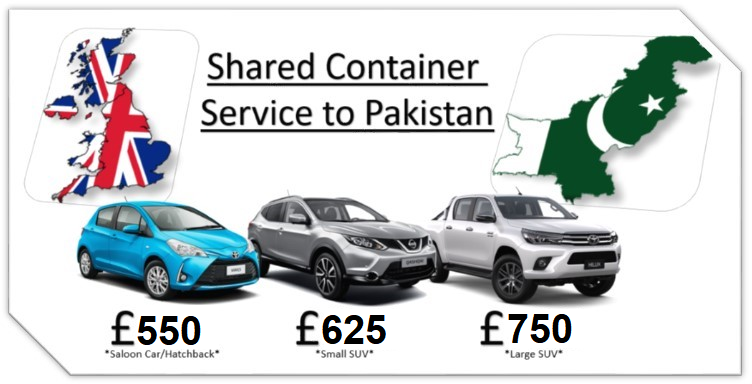 Car Export to Pakistan via our shared container shipping service, With Container shipping method we offers a secure and safer way of shipping Vehicles / Personal & Household Effects to Pakistan, Karachi. We specialise in shipping cars from the United Kingdom to Pakistan. Shipping your Car ,Van , Truck , Shipping personal items , Household goods.... to Pakistan, Karachi with Us Today! What we can ship to Pakistan? We can ship all kinds of vehicles to Karachi via container. We deal with the standard car, saloon or 4x4 as expected, but can also arrange shipments for motorcycles, vans, caravans, motorhomes, trucks and many different kinds of machinery. Click to Secure your slot now! Please fill in the booking form or contact : johnny@seakargo.com , Call 01473 375030. IF THE VEHICLE WAS MANUFACTURED IN INDIA, YOU CANNOT SHIP TO PAKISTAN. IT WILL BE REJECTED UPON ARRIVAL! THIS WILL THEN EITHER BE AUCTIONED BY DESTINATION AUTHORITIES OR DESTROYED IF NOT SHIPPED BACK WITHIN ALLOTED TIME FRAME.